A reverse search of the image showing medical staff, alongside a row of 11 newborns, reveals several articles about a woman giving birth to 11 babies, dating back as far back as 2012. The claim from March 12, 2018, originally posted on Facebook on a Nigeria-based page, is now gaining traction in Kenya. The post urges Facebook users to type “God is great” and share the post quickly to receive their blessings. We looked at the background of the image for further clues. The group are pictured in front of a poster which reads “Test Tube Baby Centre Surat”. 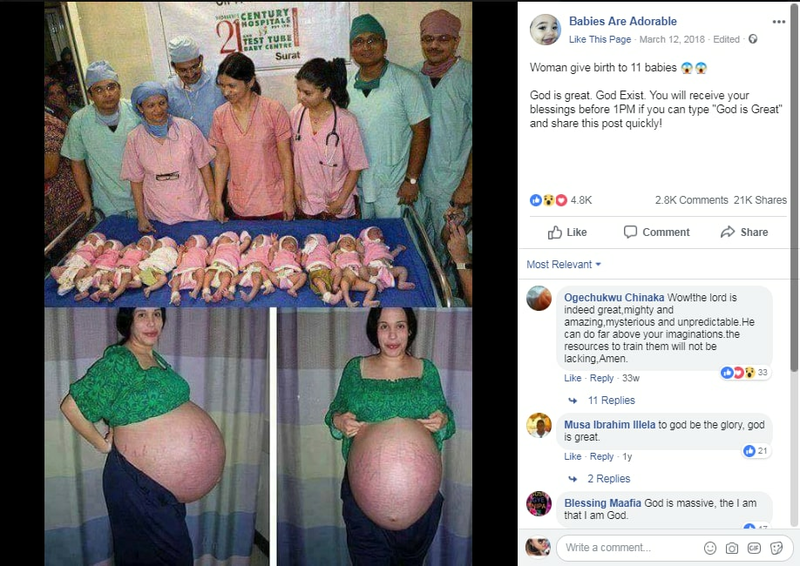 A more specific Google reverse image search of the same photo, with the search term “test tube babies Surat”, returns several articles debunking claims that a woman had given birth to 11 babies in the city of Surat in western India. In fact, the image was taken after the delivery of 11 babies on November 11, 2011 in Surat at an In Vitro Fertilization (IVF) centre. Thirty women conceived nine months earlier at the same centre. However, 11 of the couples wanted their babies born on the special 11/11/11 date and scheduled operations for the delivery, as reported by the Times of India. After the birth, the IVF centre posted the photos on the blog it was running at the time. As for the second image, portraying a heavily pregnant woman from the front and from the side, it shows an American woman named Nadya Suleman, also known as Natalie Suleman. Suleman was dubbed “Octomom” by the media in 2009 after she gave birth to eight babies, also through IVF treatment. She already had six children when she fell pregnant with the octuplets.